Do you love all things Pinot? If so, make plans to attend Pinot Paradise on Sunday, March 22 at the Mountain Winery in Saratoga, CA. 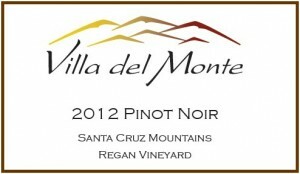 Villa del Monte winemakers John and Neil will be pouring our 2012 Pinot Noir Santa Cruz Mountains Regan Vineyard, a Wine Club favorite made from grapes from the Corralitos area. Sponsored by the Santa Cruz Mountains Winegrowers Association, the Pinot Paradise Grand Cruz Tasti ng is a great chance to try different styles of Pinot Noirs from 40 local wineries. A silent auction and raffle will feature double magnums from each winery. Light refreshments are included in the ticket price.